If you’ve ever travelled overseas, it’s more than likely that you’ve encountered a few inconvenient stopovers — be it arriving in the middle of the night, having to board your connecting flight in the small hours of the morning or touching down long after public transport has stopped running. Luckily, there’s a handful of airports across the globe that provide great facilities for those stuck in those exact situations. Offering everything from dedicated snooze lounges to simply more than enough seating, check out the best airports to sleep in before you endure your next international stopover! 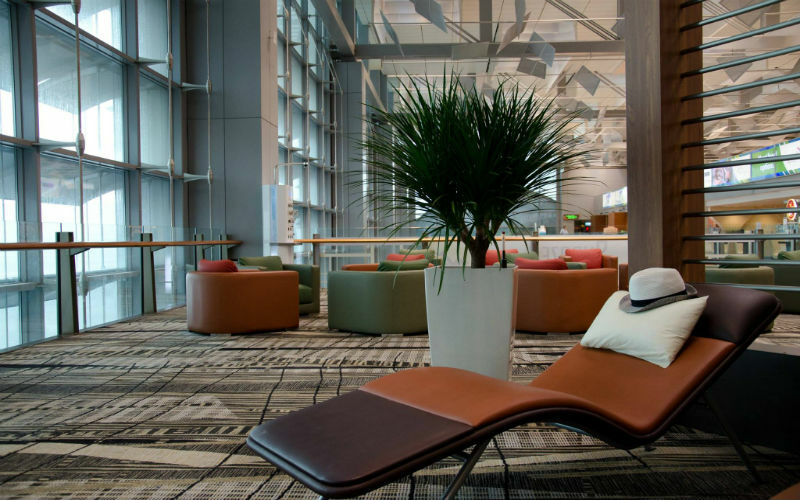 Said to be one of the best airports in the world and providing plenty to do during the day, it comes as no surprise that Singapore Changi Airport is also one of the best for sleeping. Free-to-use rest areas scattered throughout Terminals 1, 2 and 3, and pay-per-use lounges with dedicated nap rooms provide plenty of opportunities to enjoy some well earned rest. There are also several transit hotels connected to the airport which offer comfortable rooms for a whole night or just a few hours. If you’re looking to use the pay-per-use lounges, rates vary on how long you’re looking to stay and which lounge you choose. True to their name, the free-to-use rest areas will set you back nothing. There are three transit hotels to choose from at Singapore Changi Airport, including Aerotel Airport Transit Hotel in Terminal 1, and the Ambassador Transit Hotel in Terminals 2 and 3. Singapore Changi Airport, Singapore. Image Credit: Changi Airport. The largest airport in South Korea, Incheon International Airport is another transit hub that offers plenty of opportunities for sleep between connecting flights. The airport’s ‘Relax Zones’, which can be found in various areas of the building, are home to comfortable sleeping chairs that are free to use, while the 24 hour Spa on Air, a traditional bathhouse, provides private sleeping rooms and communal rest areas at a cost. The airport’s ‘Relax Zones’ are free to use, but a visit to Spa on Air does incur costs based on the amenities you wish to access. The Incheon Airport Transit Hotel is located within the airport’s departure lounge and offers the choice of half or full day rates. There are also several other hotels just a few minutes from the airport. 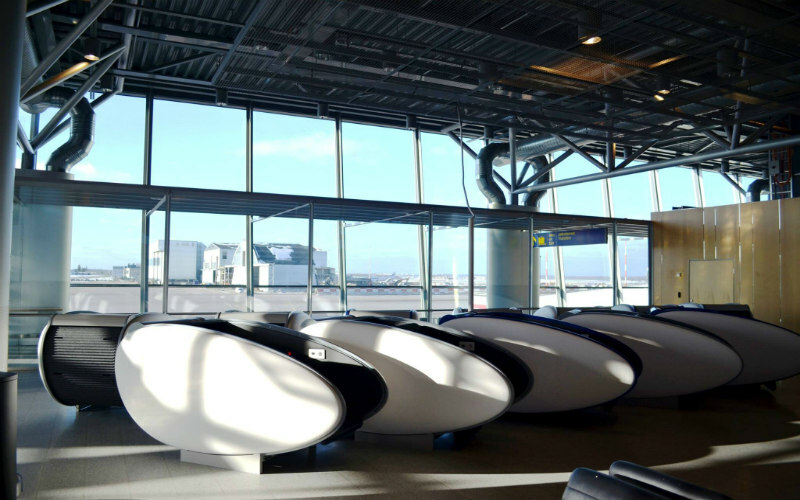 While there are plenty of reclining chairs and benches scattered throughout Helsinki Airport, the biggest draw cards for sleepy travellers in this Northern European airport are certainly the futuristic GoSleep sleeping pods. Providing space to stow away hand luggage, a pull up cover to isolate users from lights and noise, and a power point for charging, the sleeping pods are well worth their €6 an hour price tag. The GoSleep sleeping pods cost just €6 an hour, while the reclining chairs and benches around the airport are free to use. There are several options, including Hotel GLO Helsinki Airport in Terminal 2 and Hotel Hilton Helsinki Airport, which can be found next to Terminal 2. GoSleep sleeping pods, Helsinki Airport, Finland. Image Credit: Helsinki Airport. Located about 20 kilometres from the heart of the Austrian capital, Vienna International Airport provides travellers with the choice of both armrest free seating and some large lounges. Although not quite as comprehensive as others, the airport’s facilities are a great option if you’re looking to save money or have an early morning connection. If the airport’s sleeping options don’t sound ideal to you, there’s a hotel just a short distance from the airport terminals. The armrest free seating and lounges are located in common areas throughout the airport and are free to use. There aren’t too many options, but NH Wien Airport can be found just across the arrival halls. Munich Airport takes the idea of the sleeping pod to the next level with their Napcab sleeping cabins. Starting at €10 per hour, the sleeping cabins offer comfy beds, a good level of privacy and the chance to store your belongings safely while you rest. Comfortable seats and couches located in the airport’s recreation areas are also good options for those looking to recharge without breaking the budget. Use of the Napcab sleeping cabins will set you back a minimum of €10 per hour, but the airport’s recreation areas are free. While there aren’t any hotels within the terminals themselves, there are a couple of hotels located a short distance from the airport, including Hilton Munich Airport and Novotel Munich Airport. Napcab sleeping cabins, Munich Airport, Germany. Image Credit: napcabs sleeping cabins. The airport might be the best option when you either have only a few hours between flights or a very early connection, but if you have enough time available, why not head out of the airport and explore the city you’ve landed in? Sure, sleeping at the airport is an easy way to save some money, but there is no guarantee that it won’t be noisy, bright or cold. Check if there are any hotels nearby before you decide to camp out in the airport and you might just score yourself a comfortable room and a good night’s sleep. What time will you be arriving at the airport? In the evening, some airport lounges and sleeping areas can be filled up quickly by like minded travellers. Be sure to take the time you’ll be arriving at the airport and the likelihood that you’ll be able to secure a sleeping spot into consideration before you set your heart on sleeping in an airport. Does the airport close overnight? Not all airports are open all the time, meaning that while you might be ready to bunker down and enjoy a good night’s rest, the airport’s security staff may not be quite so obliging, leaving you to make different, and potentially costly, sleeping arrangements. Looking for cheap flights and great hotel rooms? Search and compare flights and accommodation across the globe with Webjet.